One of three rainwater cisterns capable of harvesting over 43,000 gallons of rooftop runoff from the Whole Foods Market and other site buildings at the Market at Colonnade. In March 2011 construction on the Market at Colonnade (Colonnade) project in Raleigh, NC was completed. 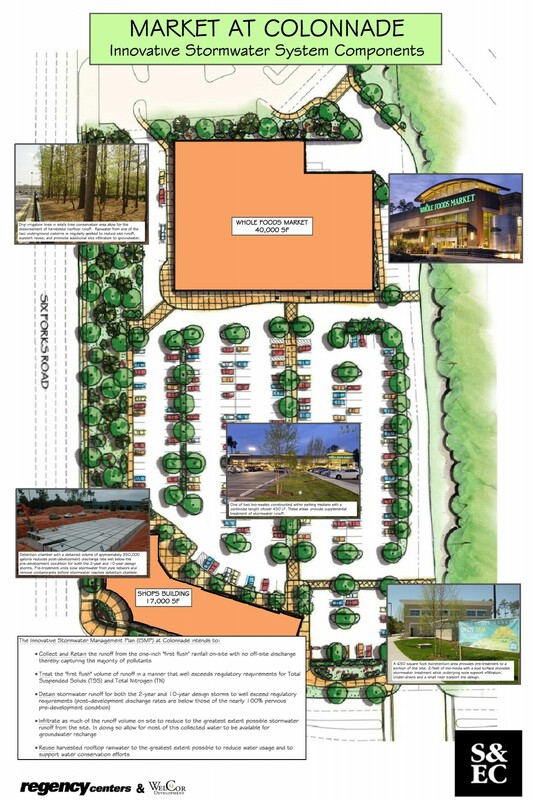 Encompassing 6.25 acres of previously undeveloped land, Colonnade has 57,000 square feet of retail space anchored by a 40,000 square foot Whole Foods Market. The Colonnade project is unlike any other within the State of North Carolina with regard to its approach to stormwater management. The Innovative Stormwater Management Plan (ISMP) includes three cisterns (totaling 43,000 gallons) which collect rooftop runoff. These, in conjunction with a subsurface gravel and pipe trench system approximately 2,500 feet in length detain the first one-inch of runoff which is then infiltrated into the underlying soils. All surface runoff from the site in excess of the one-inch storm is similarly captured, pretreated (removing oil, sediment and debris), and temporarily stored in the 185 foot by 65 foot by 4 foot tall underground detention chamber holding an additional 350,000 gallons of rainwater. A critical part of the Colonnade project, the ISMP sets a new standard in stormwater management and design. Post-development peak discharges from the 2-year and 10-year rainfall events are reduced substantially by the ISMP’s enormous detention capacity. The 2-year and 10-year post-development peaks are reduced by over 65 percent and over 55 percent respectively compared with the pre-development condition. The system’s runoff retention and infiltration from the first one-inch of rainfall drastically exceeds regulatory standards by providing near 100 percent removal requirements of Total Suspended Solids (TSS) and Total Nitrogen (TN) from the one-inch storm. By comparison, conventional stormwater devices typically only provide 85 percent and 35 percent removal of TSS and TN respectively. Harvested rainwater from the Whole Foods’ roof is stored in the 11,700 gallon cistern (pictured above) and reused inside the store for toilet flushing while additional rainwater stored in two underground cisterns (31,800 gallons combined) is used for site landscape irrigation needs. Surface bioswales and bioretention areas also allow for additional stormwater treatment beyond that provided by the large infiltration system. At the same time these devices directly provide additional localized infiltration capacity to support groundwater recharge. Colonnade’s ISMP monitoring results will be compiled and the performance monitoring data will be evaluated and used as potential design guidance for similar stormwater management plans in the future. The ISMP results will also be made available to the public and private sectors. Both retail buildings at Colonnade recently receive LEED® Silver Core and Shell Version 2.0 Certification. 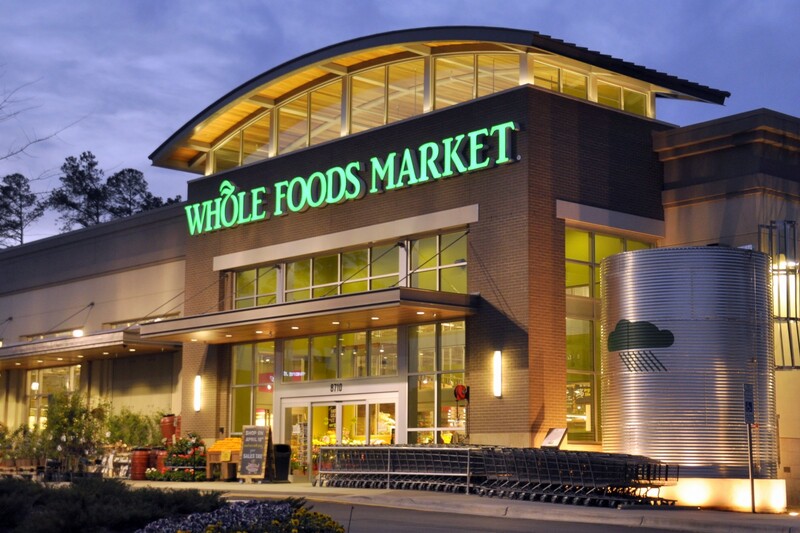 The Whole Foods Market recently received LEED Gold for Commercial Interiors Certification. In 2012 the project was recognized by the Triangle Commercial Real Estate Women (Triangle CREW) as a Champion Award Winner for Best Land Use Solution. The project was also recognized by both the City of Raleigh Environmental Award for Resource Conservation and the Greater Triangle Stewardship Development Awards (GTSDA) Program Design Recognition Award in 2011 and again in 2012 with an award for Exemplary Water Quality Protection from the GTSDA Program for its innovation and precedent setting stormwater design approach. S&EC is currently performing quarterly and annual inspections of the various site Best Management Practices (BMP’s) and preparing annual reports for the City of Raleigh.